The HHF2005HW model has been discontinued. Please see the HHF-SD1 as a possible alternative or contact our Flow Engineering department. The HHF2005HW hot wire anemometer with real time data logger has multiple features and an RS232 computer interface that make it suitable to use in such applications as environmental testing, balancing of fans/motors/blowers, air conveyors, clean rooms and flow hoods. What sets the HHF2005HW apart from other hot wire anemometers is that it incorporates a real-time data logger that can store up to 16,000 entries. 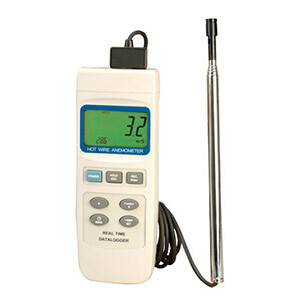 The HHF2005HW measures velocity, and air temperature, and has an input probe socket that accepts a Type J or K thermocouple that can be used as a highly accurate thermometer. By entering the area into the instrument and measuring the velocity, the HHF2005HW can even determine the volume of air flow. The integrated hot wire and standard thermistors provide fast and accurate readings - even at low velocities. For added convenience, the HHF2005HW is battery powered, has auto power off and low battery warning features. A hard carrying case is included, to make portability simple. 참고: Comes complete with sensor, 4 "AA" batteries, hard carrying case and operator’s manual.